Today I’m so excited to share with you all how I decided to “propose” to my bridesmaids! Putting together these gifts has been one of my favorite parts of the wedding planning process so far. I love these girls so much, and I wanted to create a box with items they could cherish and use forever. First off, as I mentioned in my first wedding post, Connor and I are having a small wedding with just 80 people. We decided to keep our wedding party small as well, so we will have 3 bridesmaids and 3 groomsmen. Since I only have 3 bridesmaids, I decided to spoil them a bit! I know that this isn’t possible for everyone – if I had 10 bridesmaids I definitely would have chosen a different route. But since we are having such an intimate wedding party, I wanted these gifts to be as special as the girls receiving them. Before I started looking around for gifts, I headed to WeddingWire to get a few ideas. They have tons of articles to help you gather some inspiration, such as this one, and I also loved this fun and interactive quiz. Once I did my research, I had a better idea of what I was looking for. I wanted a piece that was going to be unique to our wedding, and then a piece that would be unique to them and their role as bridesmaids! 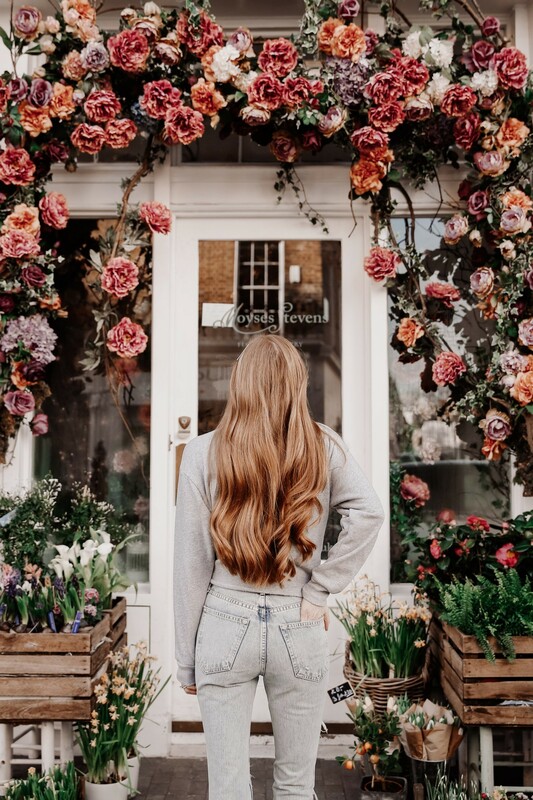 The first store I headed to was Anthropologie – they have the best gift section! 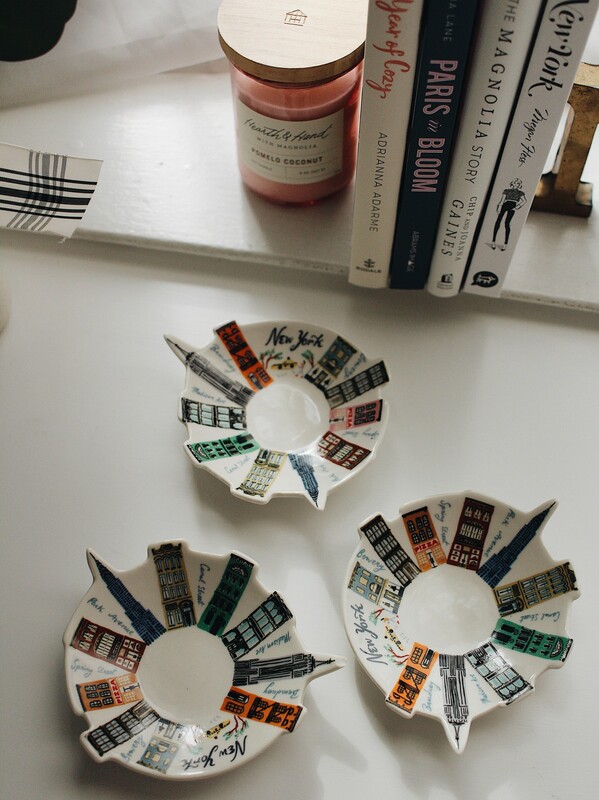 It was here that I found the cute little NYC trinket dishes. Unfortunately these exact ones are sold out, but they have a similar (and equally cute!) dish available here. This was the piece that’s unique to our wedding since we’re having it here in New York. 2 out of my 3 bridesmaids are traveling from other states, so the wedding is a fun excuse for them to take an NYC vacation! 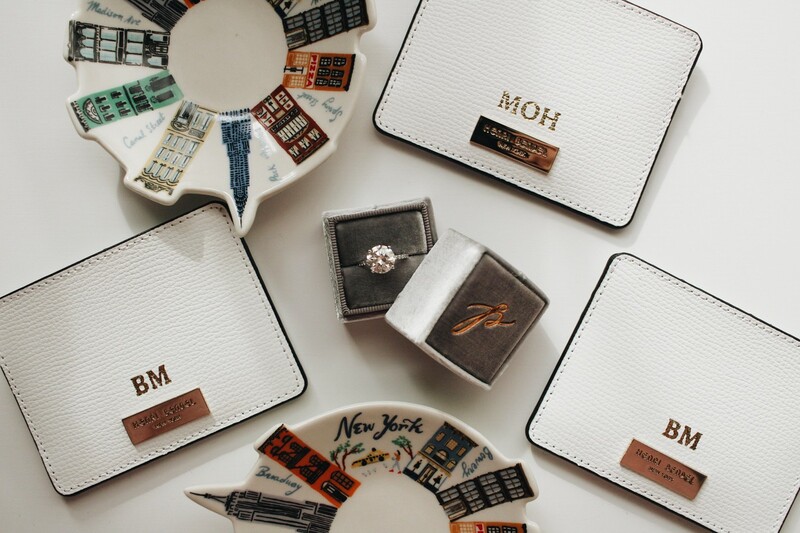 For the piece that’s personal to them, I wanted something monogrammed, and I immediately thought of Henri Bendel – they do the cutest personalization on their bags and wallets. After browsing their site, I found these white card cases. I knew they would be perfect because white is synonymous with weddings, and I was able to have “BM” and “MOH” monogrammed in gold on the front of the cases. I also found the cutest cards (not pictured) from Lola Louie Paperie. The cards are a bit of a splurge at $6 a pop, but it was important to me to have a beautiful place to write my messages! I had so much fun putting these boxes together, and I can’t wait for the year ahead with these girls! Such a cute idea! Love how you asked them! this is such a fun idea! i loved this part of the process too and wish i could go back and do it all over again! Omg this is so cute! Which I came up with this when I asked my bridesmaids! This is so cute! Such a great idea. I decided to go low-key when asking my bridesmaids. We also had a small wedding party, 3 BM, 1 MOH. I did monogrammed makeup punches and Starbucks gift cards for each girl. I decided to go much bigger for their day-of thank you gifts. We did personalized robes, personalized hangers, jewelry to wear, and hand-made wooden catch-all trays. And it’s not “punches” but “pouches.” Can’t even blame auto-correct for that one. LOVE all of those ideas! So sweet. I still have to figure out what I will do for day-of gifts, but those all sound like such great ideas! Thank you for sharing! This is such a cute idea! I just called and asked mine! Gorgeous picks! Very inspiring for me, as I’m recently engaged and just starting to plan my wedding. Since I’m also in nYC it will be fun to follow along and see how yours turns out! By the way, we’re totally faye mini backpack twins…I have the darker blue color from last year and I lurve it so very much. Aw congrats, that’s so exciting!! Do you have a date picked out yet? look forward to seeing what you plan! 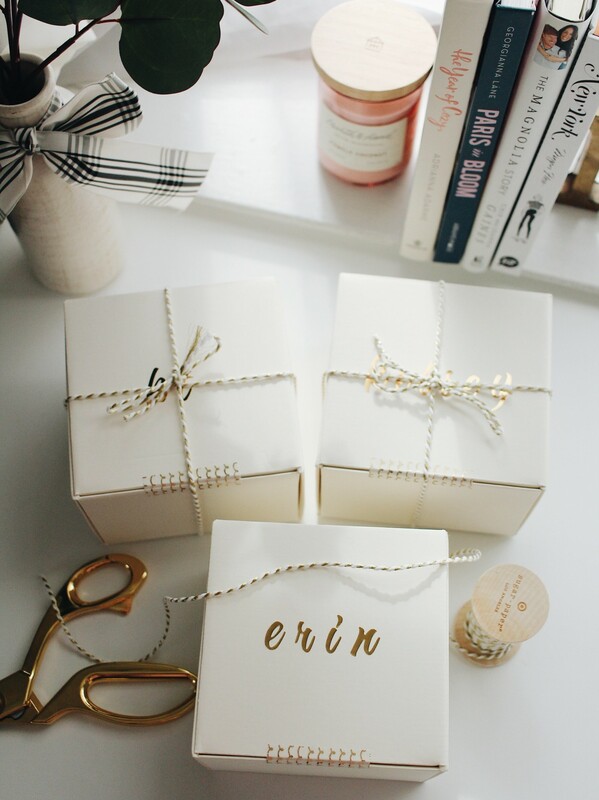 What cute bridesmaid’s gift! 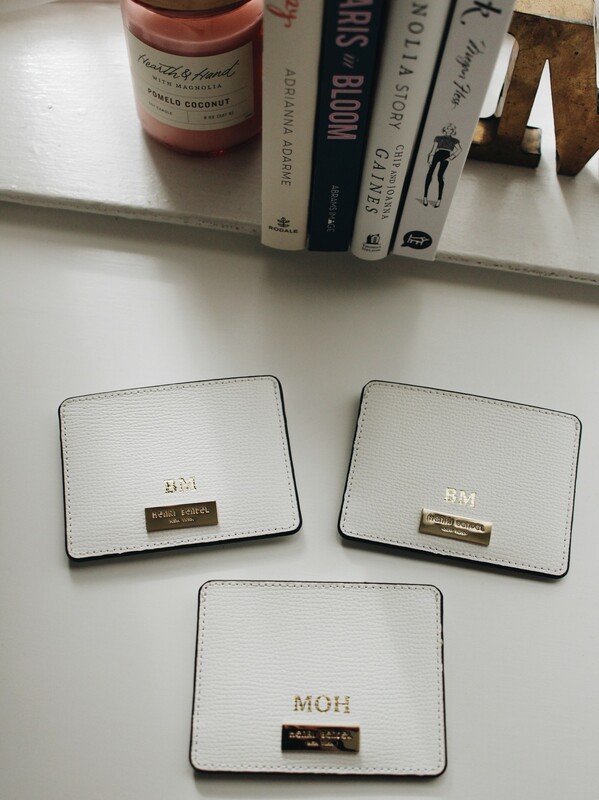 Those monogrammed card cases are adorable. Very cute gal! I adore those trinket dishes. Those trinket dishes are adorable!